You may have asked the question — “Do chicken eggs contain good cholesterol or bad cholesterol?” This is actually a common question among cholesterol-conscious people around the globe. Once you reach middle age, you might start worrying about your blood cholesterol levels as well as hardening of your arteries (arteriosclerosis). This is because as people age, the blood vessel walls will naturally grow harder as formation of plaques occur. At moment, no modern medical treatment exists yet that will help melt or remove the plaque surrounding the blood vessels. But here, we will let you know how you can soften your hardened blood vessels and feel young again. Nearly a 100% of families prefer chicken egg during breakfast. But you may have been worrying about high cholesterol contents in eggs. Some people say that chicken eggs contain good cholesterol while others say that it only contains bad cholesterol. Which is true? According to studies done, there are no good and bad cholesterols in eggs. It is just the same cholesterol in all eggs. In other words, eggs will not contribute significantly to your body's cholesterol levels. In the end, if you need to lower your cholesterol levels, it is still far more important to cut down the amount of saturated fat in your diet from foods such as fatty meats, full fat dairy products, and biscuits, cakes, and pastries. This may be a little bit off-topic. We live in a mountainside 200 meters above sea level, where the temperature is 35.6 degrees Fahrenheit (2 degrees Celsius) lower than the cities below. Here we have good friends from two poultry sites who deliver eggs to my place every other day. Can you believe that all eggs they deliver are bigger than normal? Guess what, all eggs they deliver have two yolks in them. Do you know how these egg suppliers can select and deliver eggs containing two yolks every other day? 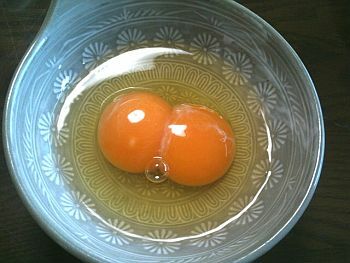 Well, double-yolked eggs are actually easy to recognize as they are much bigger than ordinary ones. 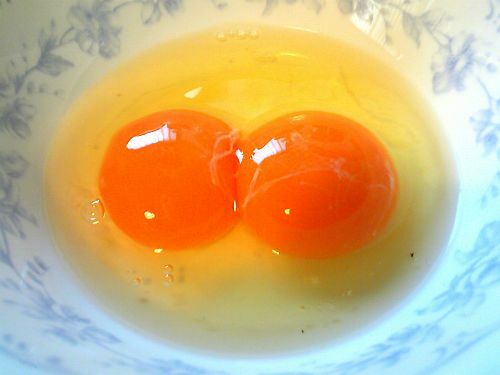 Double-yolk eggs appear when ovulation occurs too rapidly, or when one yolk somehow gets "lost" and is joined by another yolk. Double yolks are usually the result of young hen's (usually less than a year old) productive cycle not yet being synchronized. They're also occasionally laid by a heavy-breed hen, often as an inherited trait. Do not think that there are two kinds of cholesterol, good and bad one. They are just the same cholesterol. They'll be good or bad depending on your lifestyle, how often you do exercise, and the foods you eat. Many medical magazines tell you about good food, good cholesterol, good exercise, good supplement, etc. for your guidance. But just simply forget all of those! 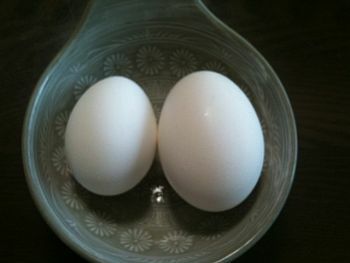 I have many friends who consume a lot of eggs every day, but they remain healthy. I also have a lot of friends who do not consume egg at all, yet some are suffering from cholesterol problems. You don't have to jog and jump. You don't have to exercise hard. Just walk whenever you have time. This is the simple technique that will help lower your cholesterol and plaque in your blood circulation system. What is the reason you have to do hard exercise, then? Depending on your profession or work, heavy and strenuous exercise may be required to gain muscles and strength. Yes, you may need to consume more fatty foods to provide you more energy. But we believe that the repair and restoration of hardened blood vessels seem to be absent during a heavy exercise. According to some data, the repairing process is only being done when you are doing a simple walking exercise. To increase your good cholesterol, do aerobic exercise, which is walking as much as you can. You may say that your cholesterol level does not reach a desirable level despite exercise. Well, do not worry about it. As long as your bad cholesterol or blood vessel plaque is reducing, then you're on the right track. You can check through Echo and Carotid Tests at your nearby clinics. 3. "Japanese Tofu and European Oatmeal Can Lower Cholesterol"